As of Ubuntu 16.04, the heirloom-mailx package is a transitional package for s-nail. Not realising this, I was having trouble with mailx not recognising the /etc/nail.rc file I’d copied from a working Ubuntu 15.10 server. As it turns out, the global config file path for s-nail is /etc/s-nail.rc. I found this out quickly by using strings to find the text '.rc' in the mailx binary: strings /usr/bin/mailx | grep '\.rc' (thanks to jpollard for this tip). “That feature” is something aggressively user-hostile, like forcing a shortcut into the Quick Launch bar or the Favorites menu, like automatically turning on a taskbar toolbar, like adding an icon to the notification area that conveys no useful information but merely adds to the clutter, or (my favorite) like adding an extra item to the desktop context menu that takes several seconds to initialize and gives the user the ability to change some obscure feature of their video card. The ‘Get Windows 10’ application that Microsoft deployed to Windows 7 and 8.1 machines earlier this year as a recommended – not even optional – update (KB3035583) sure fits this bill. Apart from looking fairly ugly (that top edge in particular is a blurry mess), there’s no way to close it even temporarily, short of killing GWX.exe in the Task Manager – note also that no-one thought to give it a descriptive name; it’s just ‘GWX’. I understand Microsoft’s desire to have users promptly upgrade to Windows 10 (even if I wish they would delay its release by a year or so), but this kind of approach just destroys goodwill. 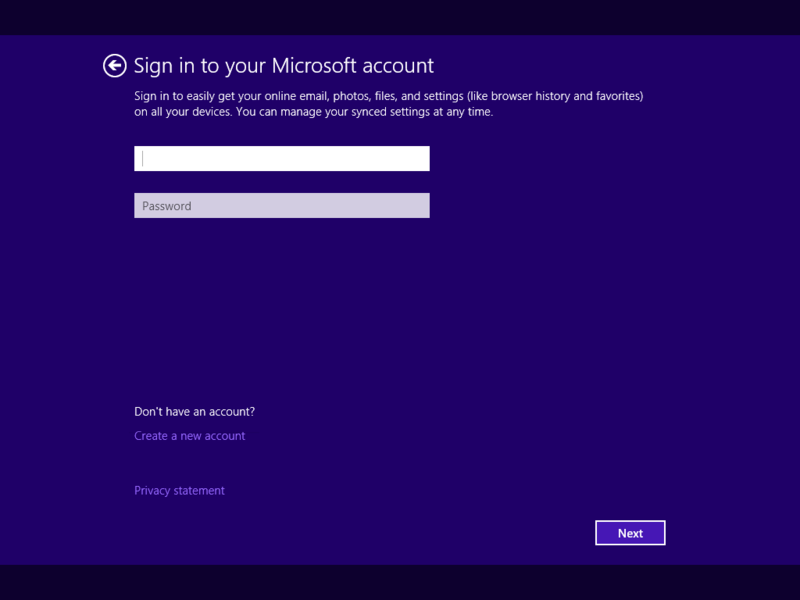 In Windows 8, users were strongly encouraged to use a Microsoft account to sign in to their computers. For those of us who preferred local accounts, the option to ‘sign in without a Microsoft account’ was presented in faint text at the bottom of the screen. 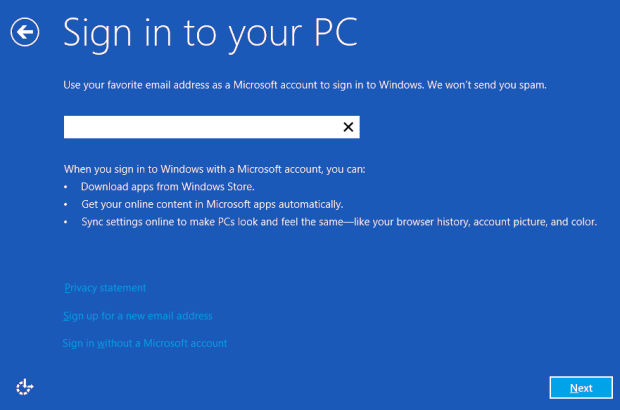 In Windows 8.1, the option to use a local account for a fresh installation appeared to be missing entirely. Only entering a bad username/password combination or disabling internet access would allow one to create a local account. 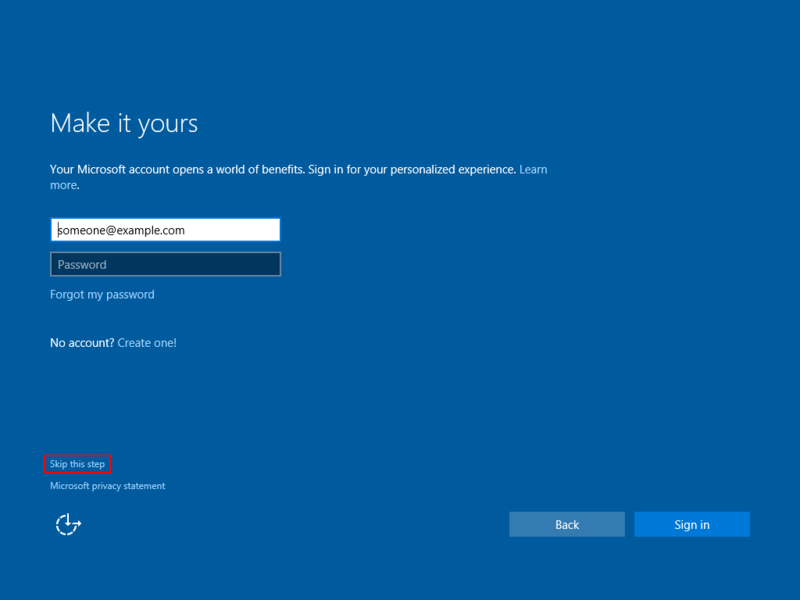 As of build 10125 of Windows 10 there is once again an easy way to create a local account – an option to ‘skip this step’ is available. This is a small but very welcome change and I hope it survives to RTM. In related news, the OneDrive desktop client in Windows 10 no longer requires that the user be logged in with a Microsoft account (of course, one must still sign in to OneDrive separately with a Microsoft account). Continuing the Microsoft tradition of skipping version 13, the internal version number is 14 (Visual Studio 2013 being version 12). Update (2015-04-22): Somewhat surprisingly, a recent Office 2013 patch appears to have fixed this issue. 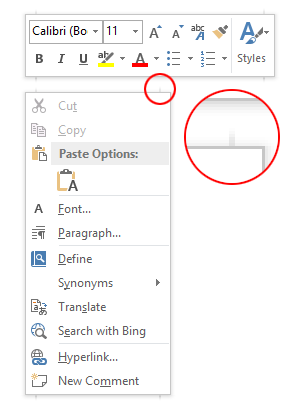 Update (2015-03-04): Office 2016 fixes this. This didn’t always happen, as a quick search for ‘Word 2013 screenshots’ will reveal lots of images of glitch-free floating windows. I’m too lazy to check, but I’ll hazard a guess that this started happening with Windows 8.1 or Windows 8.1 Update 1. Being Office, they’ve re-implemented every GUI element themselves instead of letting the OS handle them. One can sympathise with this approach, but it’s important to get the little details right. A bit like how the IE team should finally spend the time to get their scrollbars right. 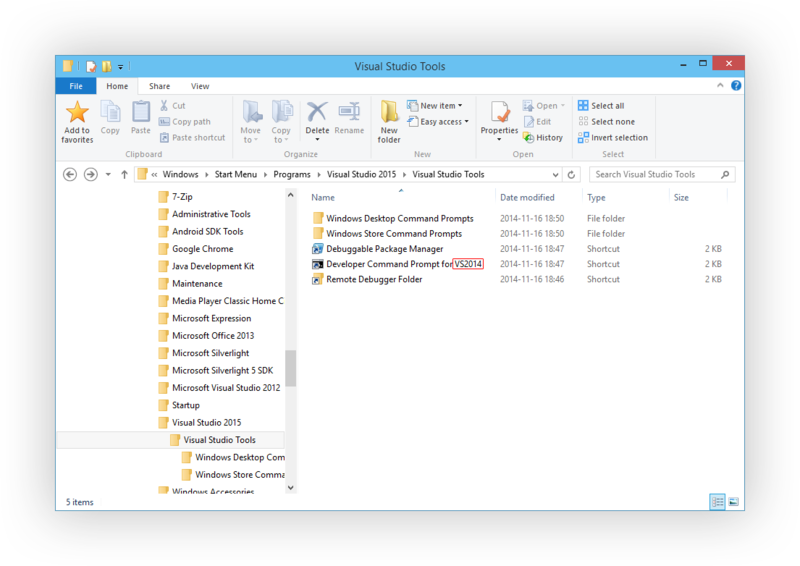 Of course, it’s folly to ever expect UI consistency on Windows when even Microsoft can’t get it right. A man can dream, though. A man can dream. Posted byquppa 2014-07-29 Posted inMiscellaneous, OfficeTags: artefact, glitch, office, office 2013, windows 8, windows 8.1Leave a comment on What's up with Office 2013's context menu and tooltip shadows?